One of the housekeeping items around activating a Jamboree on the Air station is to first register for the weekend and then to follow-up with a report of your operation. 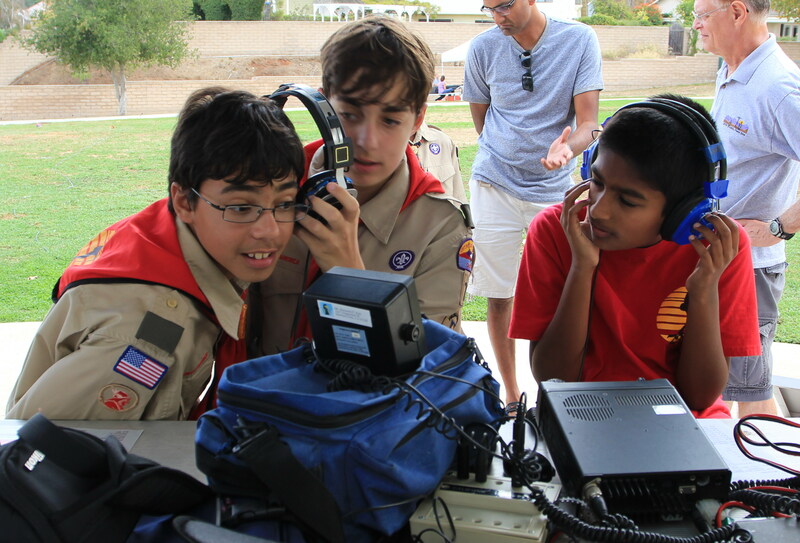 This helps the BSA gauge and report activity levels as well as publicize the fun, technology, and magic of amateur radio. For background, you can review the JOTA Reports and JOTA Videos on this website. The last few items can be determined from your logbook. The others will need a reasonable assessment of the traffic through your station. One of the best practices is to appoint someone to take care of the count. You'll also need to record: location, council name, amateur radio call sign, along with contact name/email. Photos help catch the essence of your JOTA operation. While photos of your equipment and antennas can be interesting for ham radio operators, they don't tell the story of your operation. That takes photos of Scouts in action, ideally with smiles or expressions of discovery. The photo nearby shows the KK6FUT operation from JOTA 2015. You can see that the Scouts are clearly engaged and sharing the excitement of a contact. This took a photo from behind the gear but in front of the Scouts. Taking photos of the backs of heads doesn't really capture the essence of the experience. Another best practice here is to appoint someone to take photos throughout your JOTA event. You'll be lucky to find just a few photos that really convey the essence of JOTA from the hundred or so that you'll take. If you're actually telling the story of your event, nothing accomplishes that better than a well done video. The Delaware Valley Radio Association and W2ZQ produced this video to provide some tips on shooting and editing your own videos. For further information on capturing video see Tell Your JOTA Story With Video. Video Tips for Better Storytelling from K2BSA on Vimeo. Capturing stories can be really challenging. It's basically using just a few sentences to express the Scout's experience. Here are two wonderful quotes that came in from station reports for the 2013 JOTA. “I’ll never forget the smile on one Scout’s face when he just finished talking to another Scout at the K2BSA/0 station saying ‘WOW! This is COOL!’” WW2BSA, Patriot's Path Council. You can see that these really capture what we're trying to accomplish during Jamboree on the Air. Catching them and recording them can certainly be a challenge. But keep your eyes and ears open for just this type of story to share in your station report. Good luck with your operations. We're eager to read your JOTA report and see your photos and videos.